Property has a beautiful energy - immediately relaxes. Little self contained cottage was perfect lovely and clean. Will be recommending to our family and friends. 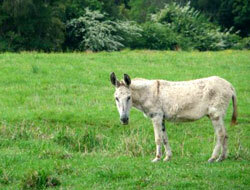 Part of the wonder of coming to the farm is meeting our animals. Animal feeding happens in the mornings (this may differ depending on weather and our work schedule on the farm) at 08:15, except Sunday, when we all have a sleep in. We feed the Cattle, Hens, Geese, Ducks and give the Guinea Pigs a cuddle. Come and meet the animals and hear the wonderful stories we can tell you about them – it is easy to see Beatrix Potter got her inspirations for her wonderful stories when you spend some time with our menangerie. 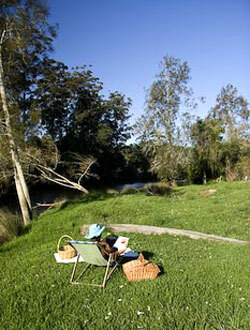 The river frontage provides a wonderful space to swim, fish and boat. Boating equipment is provided and if you are really lucky, when you are swimming in the river – you may even have a visit from a dolphin or two!! Some guests have also had great success snaring a Mudcrap or fish for dinner. A highly recommended activity is to take one of the boats out, there are many tributaries to explore not to mention the “special times” when the sun is rising, setting or when the moon is full – its simply magic all of the time. 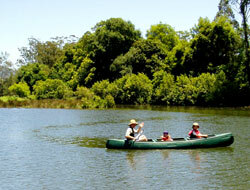 Water activities include swimming and boating by kayak or canoe which are provided with our compliments. The Kalang River is tidal so everything you get in the ocean we get in our river. So good fishing is at your door. There are also a number of places to launch a boat in the area, so this is fun to explore. 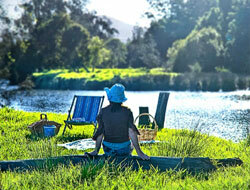 In the winter time it’s wonderful to have a camp fire at Bellingen Farmstay, which can be arranged. Bring your marshmallows, stories and musical instruments. There is always something for the kids to do. 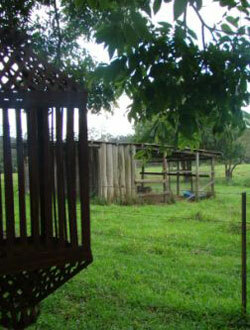 In addition to kayaking and animal feeding, there is also a sandbig and swing for the kids to play with. Fiona has a Diploma of Remedial Therapies. Body massages are by appointment only. Charge is $60 – 1 hour. Fancy going out, just the two of you? Or perhaps an outing such as white water rafting? A baby sitting service is available by appointment only. Charge is $10 per hour. Log in Copyright © 2019 Bellingen Farmstay - All Rights Reserved. Web site design and hosting by Dynamic Web Solutions.